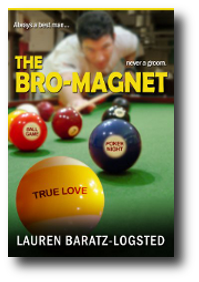 Lauren Baratz-Logsted writes chick lit that lots of women can laugh at and relate to, which is why we call her a sister-magnet. If you've read "The Bro-Magnet," one of her more recent novels, about a guy whom other guys want to hang out with, you'll know EXACTLY what we're talking about! Lauren was an independent bookseller and buyer for 11 years before deciding to take a chance on herself as a novelist. While trying to sell her books, she worked variously as a Publishers Weekly reviewer, a freelance editor, a (sort-of) librarian, and a window washer. Her first novel, "The Thin Pink Line," about a woman who fakes an entire pregnancy, was published by Red Dress Ink in 2003 as their own first-ever hardcover; it was also the first book from any Harlequin imprint to ever receive a starred Kirkus review. Since then, Lauren has had 23 more books published for adults, teens and children. The most recent are Book 8 in "The Sisters 8" series for young readers, which she created with her husband and daughter; the YA novel, "Little Women and Me;" and "The Bro-Magnet" and "Z: A Novel," both of which are adult novels published as e-books (available for $2.99 on Amazon). 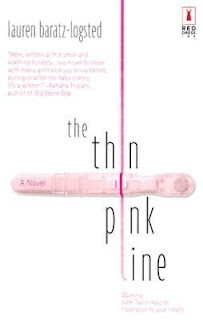 Lauren has one copy of "The Thin Pink Line" to give to a lucky reader anywhere in the US. 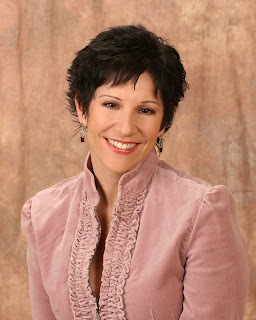 Visit Lauren at her website, and her Facebook and Twitter pages. This is actually a really hard question! My first impulse was to say "Friends," for obvious reasons. Then I thought, hmm, but what about "The Big Bang Theory?" I'm a nerd so even though I'm not a hyper-intelligent nerd like the guys on the show are, it's probably the only place on TV I'd fit in. But then I rejected both and decided to go for - drum roll, please! - "I Love Lucy." Can you imagine having best friends forever like that? Living next door to each other and even traveling the world together? I'd love that. I'm going to go with David, the gay Israeli ex-fighter pilot who's the best friend of crazy Jane Taylor in my own first novel, "The Thin Pink Line." He sees who she is, warts and all - and Jane's got a lot of warts! - yet he loves her, fiercely. Bridget Jones. She'd be a good influence. I'd watch her keeping track of how many calories she consumes and what she weighs every day, and how at the end of the year there's almost no change in her weight. This would inspire me to abandon my decades-long battle with my own last 10 (or 20) pounds. Then I'd use all that extra time and energy to take over the world. Thank you, Bridget! How did you meet your best friend? I have two best friends. One I met outside a high school dance in 1977. I told her I felt like a peach - not that I felt like eating a peach, but that I literally was a peach. OK, maybe I'd been drinking. The other I met in 1987 when she came to work for the independent bookstore I was assistant manager of. So I've been friends with one for 35 years and the other for 25 years. These three words describe both of them: smart, funny, beautiful. This is as hard as that TV question! Does calling all over NJ to see if we could find Bruce Springsteen count? Jennifer Aniston. She looks like my peach friend. Jon Stewart. He's smart and funny and he knows how to sell books. Ever a time where you thought you knew a friend but it turned out you didn't know them at all? More times than I'd care to think about. Now that's depressing. So let's end on a perkier note. Who here loves to read? I do, I do! Who here loves to write? I do, I do! And who here is grateful to Chick Lit Central for having her on today? Um, that would be me. Thank you! Special thanks to Lauren for such a friendly chat and for sharing her book with our readers. 1. Please tell us: Which chick lit character would you want as your best friend? US only. Giveaway ends April 3rd at midnight EST. I agree with the Becky Bloomwood... or maybe Bridget Jones. She'd be entertaining for sure. I follow blog via email and FB! Lara from Sophia Kinsella's "Twenties Girl" seems like she would be fun to be friends with. I think it would be fun to be friends with Becky Bloomwood. Looking forward to read your book!! !